Yesterday, Peter Corbett of iStrategyLabs posted a data set of 65,000 tweets and facebook statuses with the hashtag #dctech and challenged the community to visualize it. Using the Python csv library, I imported the data from a csv file. I scrubbed each tweet/status using regular expressions and the NLTK stopword corpus (I added some of my own stopwords after examining the data). I used NLTK to create a frequency distribution of words and two-word phrases in the tweets/statuses. I fed this data to a Python word cloud library. I also filtered out just the handles to see who gets mentioned the most. #DCtech is "great" and "awesome". 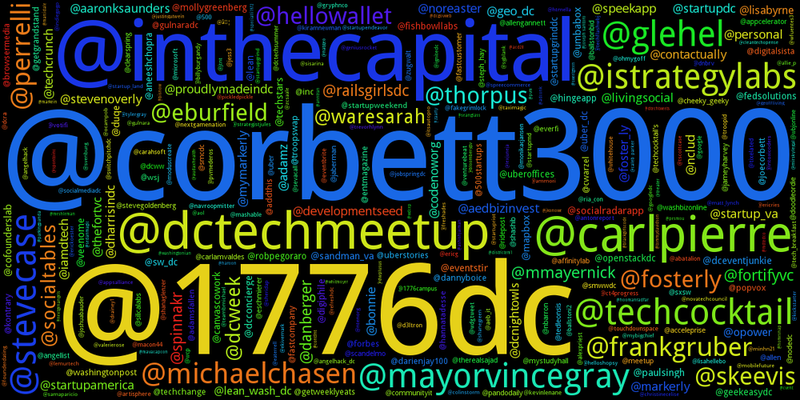 @1776dc, @corbett3000, and @inthecapital are the cool kids in school.